Sang Sool Shim and Keum Sun Lee are self-taught potters, together they collaborate on ceramics that incorporate both traditional Korean and contemporary ceramic techniques. Their works reflect their cultural heritage and a life set in the Waitakere Ranges. Their two-way clay practice is an extension of their relationship as husband and wife. Pottery became their self-selected career in 2001, it meant the couple could work together full time in their home based studio. Primarily their small and large scale ceramics are hand built by Shim and then intricately decorated by Lee. Shim is a renowned 8th Dan master in the Korean martial art Tae Kwon Do, he was the former national couch for Brunei and instructor to the Brunei royal family. Now he tackles the intense physical nature of clay, often starting with 15cm thick slabs of clay he paddles and hand forms this dense material into delicately thin oversized vessels and sculptures. 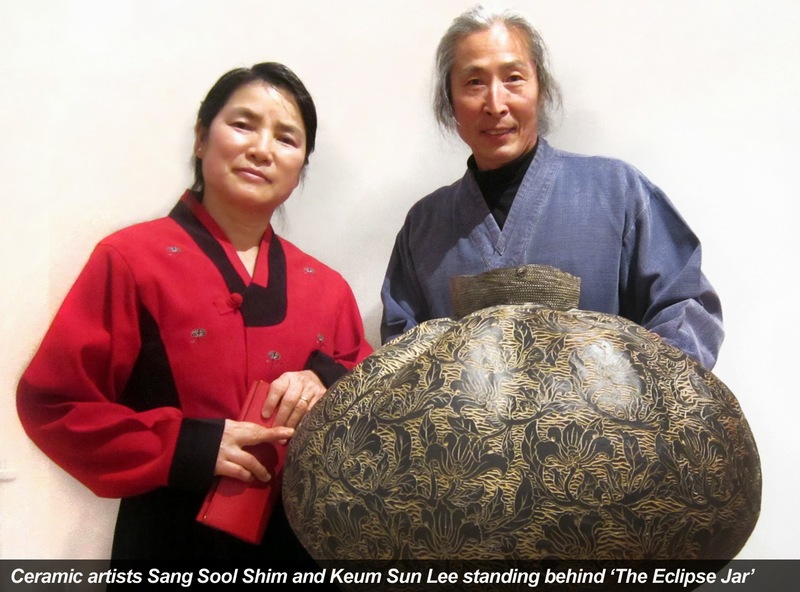 Lee has a Doctorate in public administration and since living in New Zealand has turned her academic mind to study classical Korean ceramic decorative techniques. Many of the decorative methods featured in this exhibition come from the Bun-cheong style of ceramic ware which dates back to the Koryo Dynasty (918 -1392AD). Lee in particular specialises in several of these techniques including, Sanggam in which designs are incised or stamped before applying white clay or coloured slip which is then wiped away to reveal the design. Another process distinctive to Shim and Lee’s work is Bakji a reverse inlay process in which the background is scrapped off, revealing a raised pattern. Complimentary to these customary techniques, they use equipment and materials common to the current ceramic practices in New Zealand. They fire their pottery in both gas and electric kilns and use contemporary glazes. Their time intensive clay works are completely handmade and require a lot of patience and concentration to complete. The couple enjoy this laborious and slow process as it contrasts with the pace of contemporary life. “In these days everything is so fast but we want to think of slow. That is why we concentrate and make fully handmade works. It is a kind of meditation,” say the artists. Sang Sool Shim and Keum Sun Lee are Korean born ceramic collaborators that live and work from a studio in West Auckland. Ceramic awards and accolades include; the John Green Artist Award in 2008 and 2009, the 2011 People’s Choice Award in the Portage Ceramic Awards, being international finalists in 2011 at the International Biennial of Ceramics, Austria and the International Ceramic Accessory Competition, Korea. In 2013 they were selected to present a lecture at the The 7th Gyeonggi International Ceramic Biennale, Seoul, Korea. Shim and Lee’s ceramics can be found in the collections of Kapsenberg Museum in Austria and the Portage Licensing Trust.